18 Hole Round of Golf! 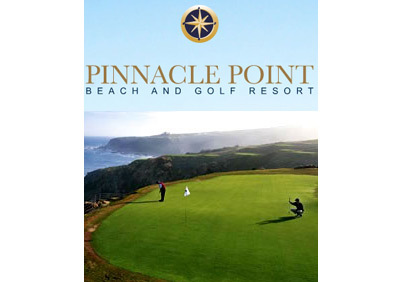 Pinnacle Point sensitively integrated with an eighteen hole championship golf course with dramatic Cliffside holes, co-designed by renowned golf architect Peter Matcovitch, and professional golfer Darren Clarke. The golf course stretches along four kilometers of spectacular coastline and over 1000 acres of unspoiled beachfront. The emerald green fairways and tees provide the perfect surface for superb shots and the bent grass greens will ensure a challenging and entertaining game. The estate features two secluded beaches and four kilometers of magnificent coastline. Located within four hundred hectares of fynbos and coastal milkwood thickets, Pinnacle point is an ecological treasure trove, certain to delight the nature enthusiast. Large tracts of the property remain undeveloped in order to protect this natural bounty and 120 hectares have been set aside for a nature reserve featuring nature trails, indigenous antelope and phenomenal birdlife. – Sit back and relax on your helicopter flight back to the George Airport. Bluesky Aviation proudly presents our next PPL and Commercial course... Starting Jan 2019.